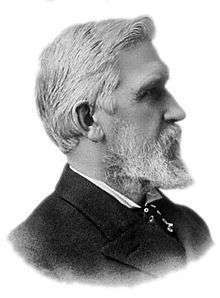 Elisha Gray (August 2, 1835 – January 21, 1901) was an American electrical engineer who co-founded the Western Electric Manufacturing Company. Gray is best known for his development of a telephone prototype in 1876 in Highland Park, Illinois. Some recent authors have argued that Gray should be considered the true inventor of the telephone because Alexander Graham Bell allegedly stole the idea of the liquid transmitter from him, although Bell had been using liquid transmitters in his telephone experiments for more than two years previously. Bell's telephone patent was held up in numerous court decisions. ↑ "Alexander Graham Bell family papers". LOC.gov. Library of Congress.